​Toronto was just one of those weekends where nothing really came together. Practice one came out promising, but once the big cars laid rubber down on the track it threw us a pretty big curve ball. In qualifying we were struggling to understand what our car needed to get around the concrete sections, putting us back in P11. ​Race 1 was early Sunday morning after being rescheduled due to weather on Saturday. When we rolled out the track was damp, so the race was declared wet. In the first turn there was a big pile up and I was able to get around it. Seeing some dry/drying spots on track the team and I made the risky call to come in for dry tires under caution. It was a very ambitious move, but I was willing to try it. I came back out at the tail end of the field. While still under yellow, I tried to feel out the best spots on the track before it went back green. Once we were back racing, I was struggling to keep up with the car in front of me. After 5 laps I had fallen back pretty far. I kept pushing as the track came to me. After a while I was starting to reel in the pack. By the checkered flag, I had only gotten by one car. All I needed was more time in the race to get back up in the fight, but that was the risk in the decision. I can put that experience in my back pocket and remember it for some other time. ​Shortly after, Race 2 was a redo for the weekend. I started the race in 10th. As expected, on lap 1 there was a caution. On the restart I was able to gain a few more spots. Lap after lap, I was creeping up on the pack in front of me. Just as I had reached the gearbox of what seemed to be my first victim, I was in the wall in the last turn. I just simply washed up into the marbles and smacked the outside barrier. Frustrated with myself and the circumstances, my weekend was done. ​With Toronto behind me, I am even more motivated to reach that top step. 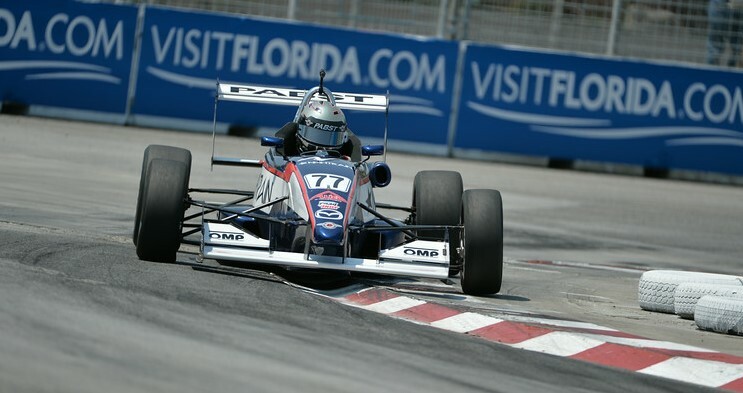 Unfortunately, I couldn’t keep up the momentum from Lucas Oil Raceway, where I earned my first USF2000 podium. But the best guys in this sport make their own momentum, and that’s what I plan on doing in a couple weeks at Mid-Ohio. Previous Previous post: How can a rooster tail, make the IndyCar Series look like a goat?